Where Have All the Stations Gone? My uncle enlisted in the RCAF at the age of 18. 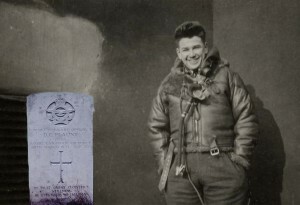 He trained as a bomber pilot and by early 1943 he was flying missions over Germany until his death on March 14, 1943. This is the story of his life and death. Remembrance Day 2018 : Click on each photo for caption. On November 10, 2017 I was involved in an interview with Markus Schwabe on Sudbury’s Morning North: Interview with Markus. I've read many WW 2 stories and would class this one as among the best in capturing the frustration and uncertainties involved by airmen. As I read through his story I was touched with its poignancy. The author’s choice of the letter material is telling for an old sweat like me. Such scenes as the inefficiency of the coal stove which spewed smoke and some heat into the sleep space of the Nissen hut reminded me of what I lived through. I was amazed at the flow of letters and goodies to Donald, when in my case, in nearly three years in the U.K., Malta and Italy, I think I only got cigarettes a couple of times from some kind source. The youth of these airmen comes through loud and clear. Your depth of research awes simple old me. A great read. Well done. Write Soon and Often is the fascinating story of Donald Cameron Plaunt, a bomber pilot, of Sudbury, Ontario who was killed over Germany in 1943. The book is lovingly compiled from letters he wrote to his family and written by his nephew Andy Thomson. The author has skilfully stitched together excerpts from the letters, the letters themselves and the author's summaries of them within the context of the war. Hundreds of books have been written about World War II. None that I have read comes close to being as good or as readable as this one. This was an engaging read! You have woven snippets of letters with your knowledge of the family with the result that I really had a sense of this young man’s life and his times. It was very effective! I have a full appreciation of his personality, desires and attributes as well as his frustrations. He was fully aware of the political and social environment and I am certain he would have fully participated if he had been given a chance to live longer. Six sorties in 9 days! I cannot fathom how he could tolerate the stress of that period! The madness of Bomber Command, Harris and all the rest who thought this one out. Dieppe Raid is another example. Your visit to Ottawa with the students and the meeting of the two bridge partners illustrate chance or predestination! I like the book a lot, learning things I had never realized before. It covers your Uncle Donald's story, a promising 19-year-old signing up for war duty because "it's the right thing to do". The cited logs, telegrams and historical details of the events put it into the bigger context of the war in 1942. Adding Donald's personal correspondence reveals the complex connections to family and friends. A real eye opener if one wants to understand how we are all connected and how our actions affect many more people aside from ourselves. Thanks for writing and sharing this book! I've bravissimoed (sp?) Andy on the phone to "Write Soon and Often", plus I want to pay my compliments to the editing team! It reads so smoothly and grippingly that I read it in one extended swoosh, ending at midnight last night. After Pog, this adds more depth and breadth and intimacy to my sense of the Sudbury branch. Respect too. Will be taking it to Mom ubernachste Wochenend. I'm sure she'll really enjoy it. As she knew about Alan Plaunt in 1941, she also knew of Donald's loss in '43, which spurred our reminiscences of WWII and New Liskeard. Anxious and sad times.